STEUBEN COUNTY, Ind. 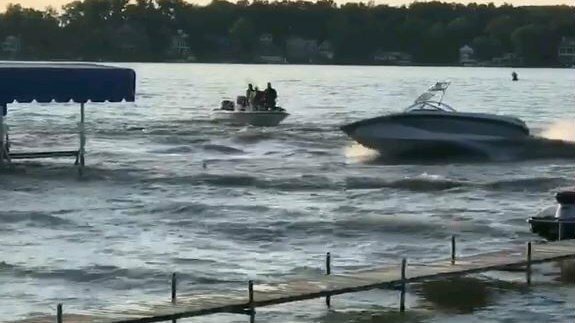 (Fort Wayne's NBC) -- Conservation officers have made an arrest in Saturday's dangerous boating accident at Lake Gage. Dominique Effinger, 20, of Fort Wayne, was arrested and now faces boating while intoxicated causing injury and being a minor in possession of alcohol. Conservation officers say Effinger was driving the 21 ft. boat at high speeds on the lake when the boat cut into a violent turn. That's when 10 people where thrown off, and the craft continued at high speeds running unmanned around the lake causing even more injuries. Conservation officers say four of those victims had serious or near-fatal injuries. Good Samaritan boaters were able to get some of those who were seriously injured to shore. Two people were flown to a Fort Wayne hospital with serious injuries, including a skull fracture and a partial lower arm amputation. Others with less serious injuries were taken to an Angola hospital. The Ski Nautique motorboat continued circling the lake going about 30 mph. Conservation Officers and Steuben County Sheriff's Deputies alerted residents in the area to move their docked boats and clear the area. Eventually an officer was able to toss a rope and get it tangled in the boat's propeller, slowing it down. The boat struck a dock and diverted it’s direction into the rear of the patrol boat the officer was operating, disabling the patrol boat’s motor due to the impact. The entangling rope eventually slowed the runaway boat. The officer was then able to use a nearby personal watercraft and jump onto the runaway boat while both boats were still in motion. He then took control of the unmanned boat and bring it to a stop, averting any further injuries and damage. Fort Wayne's NBC has learned Effinger has bonded out of the Steuben County Jail. Alcohol was found to be a factor in the accident.